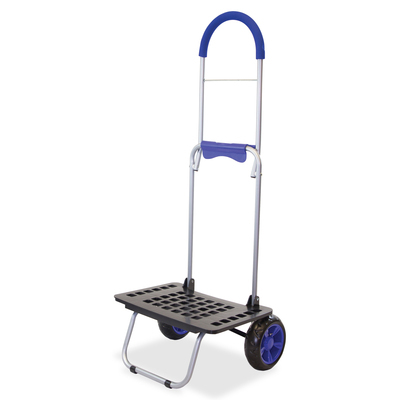 Bigger Mighty Max Dolly Is A Patented Personal Dolly Engineered To Reduce The Weight Of Heavy Loads. It Has A Soft Handle For Comfortable Pulling. It Holds 220 Lb. And Weighs Only 4 Lb. Its Oversized Beefy Wheels Allow A Smooth Roll On Any Surface. Dolly Rolls Easily On Sand, Stairs, Curbs, Cobblestones Or Any Uneven Surface. It Folds In Half For Compact Storage. Toe Plate Measures 11" X 16".. Bigger Mighty Max Dolly Is A Patented Personal Dolly Engineered To Reduce The Weight Of Heavy Loads. It Has A Soft Handle For Comfortable Pulling. It Holds 220 Lb. And Weighs Only 4 Lb. Its Oversized Beefy Wheels Allow A Smooth Roll On Any Surface. Dolly Rolls Easily On Sand, Stairs, Curbs, Cobblestones Or Any Uneven Surface. It Folds In Half For Compact Storage. Toe Plate Measures 11" X 16".